Gabriel Dawe, Plexus no. 34, 2016 (detail), Gütermann thread, painted wood, and hooks. Courtesy the artist and Conduit Gallery. 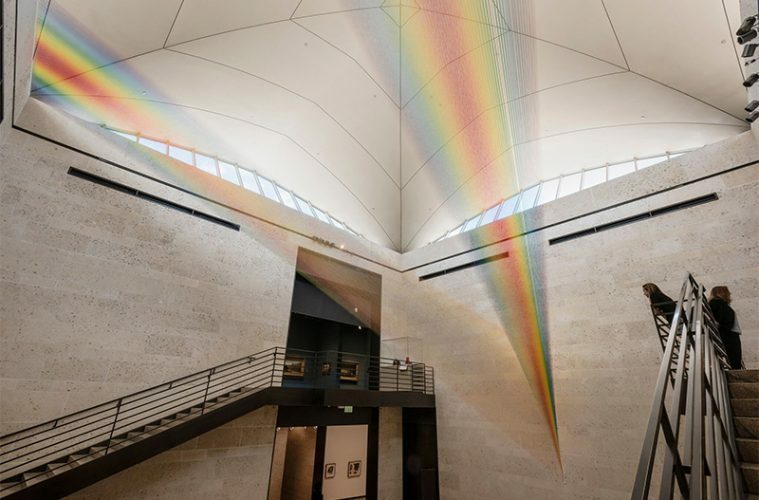 FORT WORTH—Gabriel Dawe spent two weeks scaling the Amon Carter Museum of American Art’s atrium, suspending one thread at time to create Plexus no. 34. Using a custom tool that resembles a large needle, he threads color up to the ceiling and back to the floor for 80 miles of thread. 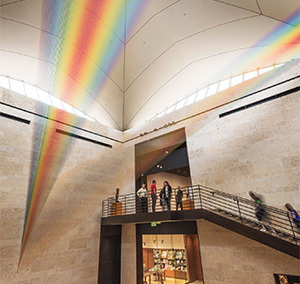 The resulting structure catches the space’s light, turning it into a double rainbow, and is on view through Sept. 2, 2018. HOUSTON—Houston Ballet opens its 47th season with Director’s Choice: American Ingenuity, featuring George Balanchine’s Theme and Variations, and the company premieres of Jerome Robbins’s Other Dances and William Forsythe’s Artifact Suite, Sept. 8-18; followed by Stanton Welch’s heartbreaking drama Madame Butterfly, Sept. 22-Oct. 1 at Wortham Center. 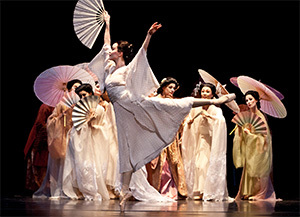 Artists of Houston Ballet in Stanton Welch’s Madame Butterfly. DALLAS—Film props, reflective surfaces, and familiar icons like Sammy Davis, Jr., Richard Nixon, Spider Man, and Bozo the Clown are hallmarks of Kathryn Andrews’s exhibition which explores themes of fame, celebrity, and image-making within in the context of the presidency—the ultimate symbol of power during this election year. 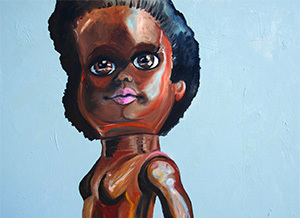 Run For President is on view at the Nasher, Sept. 10-Jan. 8. 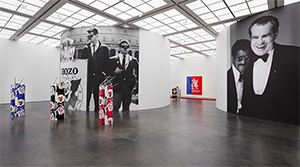 Installation view, Kathryn Andrews: Run for President, MCA, Chicago, Nov 21, 2015-May 8, 2016. Photo: Fredrik Nilsen. Courtesy of David Kordansky Gallery, Los Angeles, CA. HOUSTON—Sam Shepard fans will be thrilled to find 4th Wall Theatre (formerly Stark Naked) opening the season with True West, Sept. 8-30 at Studio 101 at Spring Street Studios and Catastrophic Theatre with Buried Child, Sept. 9-Oct.1 at the MATCH. 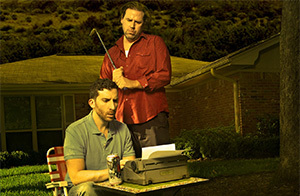 Nick Farco and Drake Simpson in the 4th Wall production of True West. DALLAS—Marcelyn McNeil’s commitment to the old-school practice of painting is evident in her bright matte colors cheerfully asserting themselves upon bold surfaces that eclipse carefully worked and reworked passages. See her new works on paper in Love and Theft, Sept. 10-Oct. 15, at Conduit Gallery. Marcelyn McNeil, Doubled Wide (detail), 2016, oil on canvas, 72 x 66 in. Image courtesy the artist and Conduit Gallery, Dallas, TX. 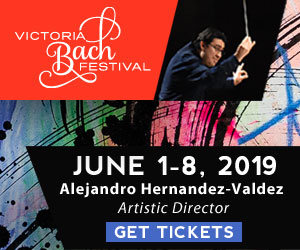 AUSTIN— Before Ballet Austin heads off on a 15-city tour to China, they open the season with a mixed repertoire, To China with Love, with a stellar program that includes two works by Stephen Mills: Liminal Glam and Wolftantz, along with Lar Lubovitch’s Dvorak Serenade, Sept 23-25 at The Long Center. Ballet Austin in Liminal Glam. HOUSTON––The CAMH presents works by Amy Blakemore, Thedra Cullar-Ledford, and Susie Rosmarin in Right Here, Right Now, the second iteration of this showcase series featuring Houston-based artists with decades-long practices in the city, on view through Nov 27. 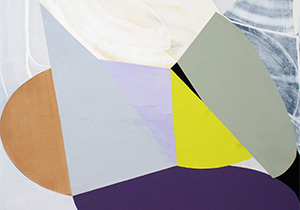 Thedra Cullar-Ledford, Proud Mary (detail), 2010, oil on canvas, 48 x 60 inches. Courtesy the artist. SAN MARCOS—ARCOS Dance premieres Domain at Engagement: Symposium of Philosophy and Dance, an international performance conference hosted by Texas State University in San Marcos on Sept. 10. Domain follows the life of an unorthodox inventor who is diagnosed with a terminal illness while accepting a prize for designing ANNI, an advanced artificial intelligence. 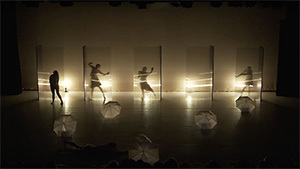 ARCOS Dance performs Hoaxers, the opening prelude of Domain. Photo by Eliot Gray Fisher. DALLAS—David Bates, who says he has always loved the phenomenon of weather and the power of nature and the sea, presents a collection of striking, emotive works depicting life on and near the water in Paintings and Sculptures, at Talley Dunn through Oct. 29. David Bates, Storm Tide, 2015, oil on panel, 42 x 84 inches. Courtesy Talley Dunn Gallery. DALLAS—TITAS Presents opens their season with the dynamic Aspen Santa Fe Ballet, a one-of–a-kind boutique company known for its contemporary work, Sept. 16-17 at Dallas City Performance Hall. Aspen Santa Fe Ballet dancers Anthony Tiedeman and Seia Rassenti. Photo by Rosalie O’ Connor.